Lafferty came up with a moment of magic to seal the points for the resilient Robins on a wet afternoon in front of a sparse crowd. Andy Probee returned to the hosts' starting line up to bolster the defence and Bosham certainly looked to have a much better shape to the side with the extra experience involved. The first meaningful effort on goal broke the deadlock with the visitors edging in front through striker Ryan Walton. Montpellier Villa broke quickly from defence and Walton shrugged off the attention of several Bosham defenders before striking at goal and seeing his effort squeeze past the dive of keeper Harley Redman and into the corner of the net. This was a setback for the Reds but they regrouped and came back strongly. Lafferty stung the hands of visiting keeper Charlie Holmes from a free-kick and Max Terry had a good chance but was wasteful in front of goal, leading Bosham to go into the interval trailing in a game that they really should have been winning. Right on half-time the ever impressive Pat Bulbeck charged forward and created an excellent chance for himself, but Holmes made a superb save to keep him out and the Blues lead intact. Just five minutes into the second half Bosham were level. Lafferty took a free-kick and when Holmes failed to grab the ball, Terry nipped in the poke the ball past him into the net. The Reds pushed on and Villa stuttered. During incessant pressure. another goal was surely going to come and, with 20 minutes left, Lafferty duly obliged with a sumptuous finish to put the Robins in front for the first time. Receiving the ball from Bulbeck on the edge of the box, Lafferty muscled his way forward and then, turning, smashed a shot past Holmes with his weaker left foot to spark wonderful celebrations among both players and staff. Bosham brought on Neil Redman and Dave Smith late on and should have made the game safe in the dying minutes when two golden, chances went begging. 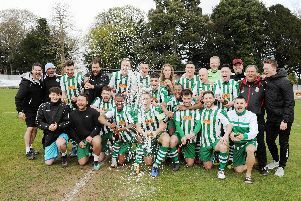 But the job had been done and there was an air of relief along with celebration at the final whistle with confidence restored in time for a tough away trip to Rottingdean this weekend. Bosham: Redman, Bulbeck, Briance, Sprier, Reynolds, Probee, Terry, Bishop, Rustell, Lafferty, Barnes. Subs: Hiscock, Redman, Smith.